Da Capo Press, 9780306820465, 336pp. In this action-packed history, award-winning author Harlow Giles Unger unfolds the epic story of Patrick Henry, who roused Americans to fight government tyrannyboth British and American. Remembered largely for his cry for liberty or death,” Henry was actually the first (and most colorful) of America's Founding Fathersfirst to call Americans to arms against Britain, first to demand a bill of rights, and first to fight the growth of big government after the Revolution. As quick with a rifle as he was with his tongue, Henry was America's greatest orator and courtroom lawyer, who mixed histrionics and hilarity to provoke tears or laughter from judges and jurors alike. 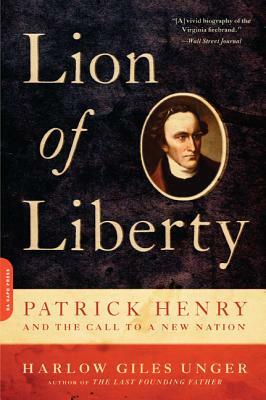 Henry's passion for liberty (as well as his very large family), suggested to many Americans that he, not Washington, was the real father of his country. This biography is history at its best, telling a story both human and philosophical. As Unger points out, Henry's words continue to echo across America and inspire millions to fight government intrusion in their daily lives. A veteran journalist, broadcaster, educator, and historian, Harlow Giles Unger is a former Distinguished Visiting Fellow in American History at Mount Vernon and is the author of sixteen books, including five other biographies of America's Founding Fathers. He lives in New York.